Bullet's new humans renamed him Beau. Below is an email we received from the proud parents. Beau is doing very well. He seems to be getting used to the idea that he is king of the house. He is a real mush at heart. 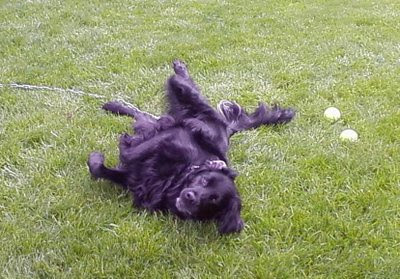 The photo is of him rolling in the freshly cut grass of the yard; we were playing ball. While he still hasn’t gotten the whole “ Give the ball back concept”, he loves to run and fetch. So if you have a number of tennis balls, you toss one, he runs and gets it…you toss another; He drops the one, and runs after the new one ! I started taking him on a second walk in the evening, (he gets what we call the Long Walk, when Laura gets home from work at around 4 in the afternoon) simply because he looked like he could use some more exercise; now like clockwork every night around eight, he walks over to the coat rack where we hang the leash, and reminds me what time it is.